Morgan began working at the Weare Animal Hospital in the summer of 2009 as a Kennel Assistant. Graduating from John Stark in 2008, she immediately continued her education at Great Bay Community College in the Veterinary Technology Program. After a semester of interning with us, she graduated in May of 2010 with her Associates Degree in Veterinary Technology. 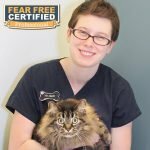 She then joined our staff as a Certified Veterinary Technician after passing her Veterinary Technician National Examination. “Morgie”, as so frequently called by co-workers, enjoys spending time with family and friends, as well as catching up on all the latest movies. She also enjoys being technologically savvy, and has become the resident “Computer Doctor” for the hospital. Morgan is owned by her very eccentric cat, Viper Striper, whom she adopted from the Weare Animal Hospital. In her spare time, she likes to perform stand-up and keep everyone she meets laughing!